This old rum is distilled from molasses by column in January 2006. 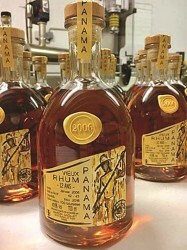 It has been stored in the Panama in American white oak barrels that contained Bourbon. Only two barrels were available. After 4 cuts by demineralized water, up 43.8% vol of alcohol, we got a series limited to 700 bottles of 700 ml. This old rum underwent no treatment by the cold, or passage on resin... A simple filtration before bottling in November 2018 was made. It has a slightly Golden and shiny dress, a vegetal nose, leaf tobacco, leather with a light smoked. A suave and round mouth to attack, then becomes peppery spicy to finish with vanilla notes. Very nice balance, sugar / alcohol. Despite its higher than 40% alcohol content, it blends perfectly in the palate.